'Hand over mouth! Yes, that was my reaction!... Raised the hairs on the back of my neck. Oh my!... I have discovered a new favorite author! I not only recommend this book, but the entire series as well. Oh do I ever hope we will be seeing more of Robyn.' Goodreads Reviewer, Five Stars. ‘I was glued to the pages' Goodreads Reviewer, Five Stars. This was the fifth in the series and I haven't read the other four, but that didn't really make any difference as this works as a stand-alone. This is a really well written crime-thriller with a lead detective who is smart and determined and very likeable. There are so many twists and turns in this story, that it takes a while to find out what might be going on, which I like in this type of story, and it makes it all the more satisfying when you get to the ending and it all comes together. BOOM! And you have an 'ah, so that's what was happening' moment and then you can go back in your mind and spot all the clues. Now I'll have to go back to the beginning and read the others! in the series! Interesting read with enough twists and turns to keep you guessing. Worth a read. Surprised as to who the killer was. Starting with the gruesome murder of Jordan Kilby, whose body was discovered in a field, there are other equally heinous murders that follow soon thereafter. There is a common thread, definite connections. But what? Can DI Robyn Carter solve this case before she is removed from this investigation? Robyn clearly senses powerful links to the murders, and follows every lead possible to identify the murderer. In so doing, she develops a bond of sorts to Jordan's girlfriend. Hand over mouth! Yes, that was my reaction! There are two shockingly specific twists that raised the hairs on the back of my neck. Oh my! Most of the time with thrillers the twists come so fast and hard that I am shocked as to who the killer is. However, in The Chosen Ones, I knew for quite some time. Even so, I had loads of fun rooting out the motive while Robyn and team raced to find out. Well done Carol Wyer. Also, during the progression of this series, there have been clues of a different sort involving the death of Robyn's fiancé Davies. Is he really dead after all? Then there is Ross, a private investigator and Robyn’s cousin. It was great to see a bit more of Ross in this book. When I received this for review, I purchased, read and reviewed the first four books in this series. I generally do this with any new authors or series that I learn about. Doing so allows me to enjoy familiarity with the characters in the books that I read. Having done so here really pleased me. For one thing, I have discovered a new favorite author! I not only recommend this book, but the entire series as well. Oh do I ever hope we will be seeing more of Robyn. 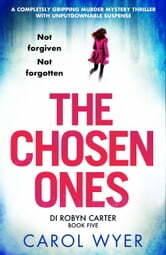 Many thanks to Bookouture and to NetGalley for this ARC to review. Another amazing book by Carol Wyer. Can't wait for the net Robyn Carter book and hope it revolves around Davies!!! Need more books by Carol Wyer...! !